Cholera victims rest at the hospital of MSF (Medecins sans Frontieres) on December 22, 2010 in Sarthe, a suburb in the north of Port-au-Prince. Port-au-Prince, Haiti (CNN) -- At least 45 people, most of them voodoo priests, have been lynched in Haiti since the beginning of the cholera epidemic by angry mobs blaming them for the spread of the disease, officials said. "People who practice voodoo have nothing to do with the cholera epidemic," said Max Beauvoir, the head of a voodoo organization in the Caribbean country. Beauvoir said Thursday that he has appealed to authorities to help before the situation gets worse. Some of the victims were killed with machetes, others were burned alive by mobs that added tires and gasoline to stoke the fires. 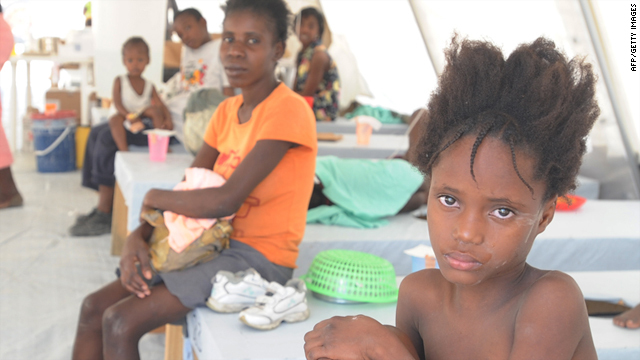 The cholera outbreak started in October. Forty of the victims were found in a southwest area of Haiti called Grand Anse, said Moise Fritz Evens, a communications ministry official. The victims have been targeted because of "misinformation" that had been circulating in the community that voodoo practitioners were spreading cholera by using witchcraft, according to communications Minister Marie-Laurence Lassegue. "It was necessary to increase awareness of the disease and educate the population countrywide instead of getting into a religious war that has no ending," Lassegue said. The killings add to ongoing woes that have hit the island after the devastating earthquake in January. About 220,000 people were killed in the earthquake, and countless others left homeless. A cholera outbreak after the earthquake has killed more than 2,000 people, health officials said.